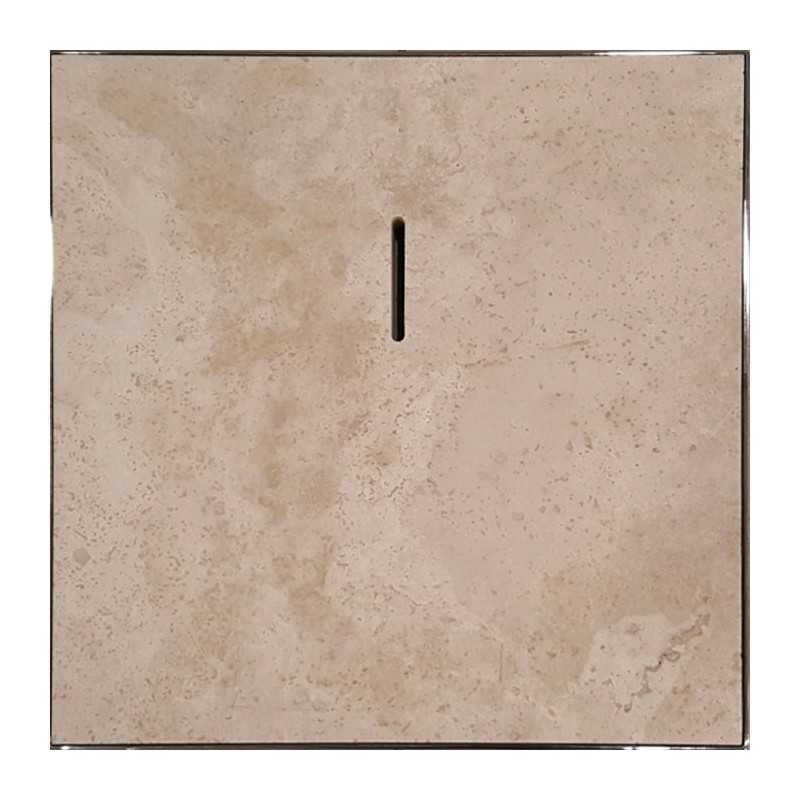 Skimmer Lid with Mid to Dark Tones Tumbled Unfilled Travertine. Durable marine grade 316 stainless steel tray which complies with Australian Standard AS 1926.3 2010 Swimming Pool Safety - Water Circulation System. 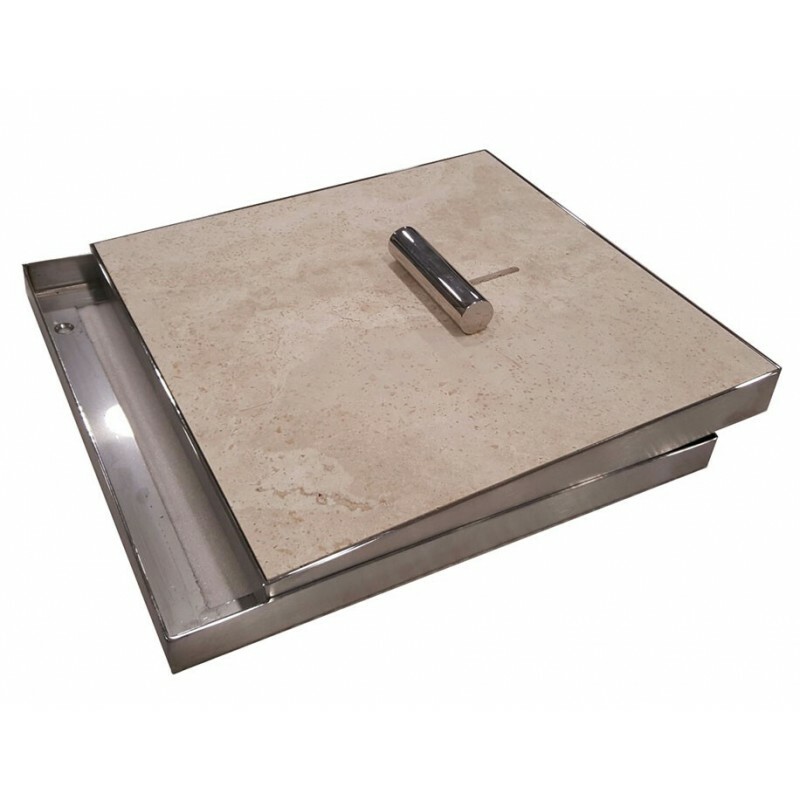 The QUAD Skimmer Lid comprises a 2mm thick 316 marine grade stainless steel tray with the selected paving matched, fitted as a stone infill. A keyway slot is cut into the stone infill prior to assembly into the slotted tray. 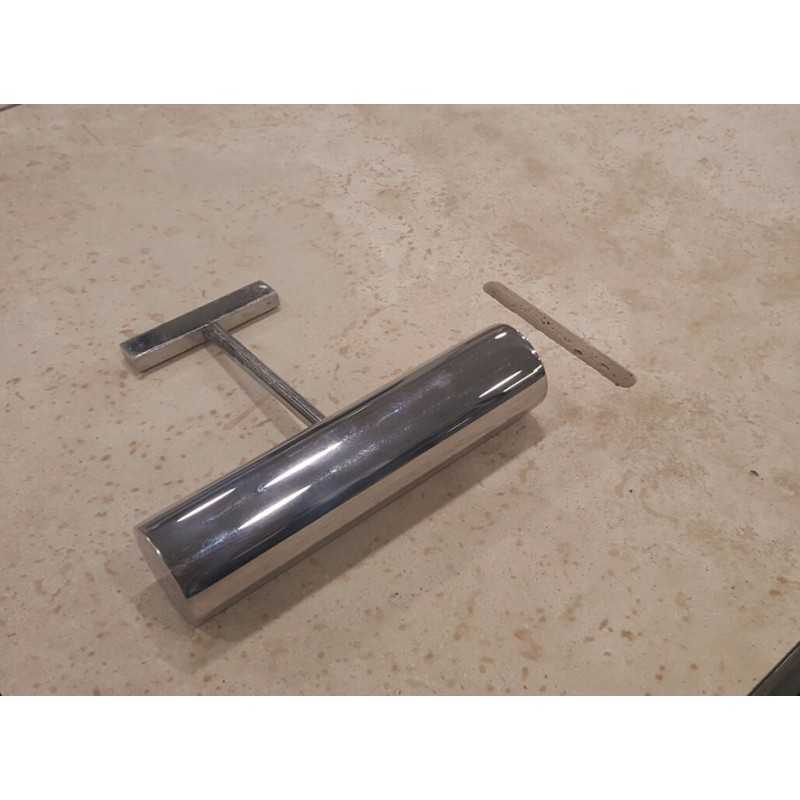 The tray supports the stone and protects it from chipping, cracking and possibly breaking. Replacement stones or tiles to match may not be available in the future. The dimensions of the square tray are 336 x 336 mm. The depth of the tray can be chosen depending on the thickness of the paving material to be inserted. Four depths are available as standard: 15mm (to suit paving material 12mm or less), 25mm (to suit paving material 20mm or less), 35mm (to suit paving material 30mm or less) and 45mm (to suit paving material 40mm or less). Custom depths are also available. Included in the kit is a heavy duty stainless steel key that allows controlled removal of the lid. This key should be kept out of reach of children so they cannot access the skimmer box. This keyed access meets the Australian Standard AS 1926.3-2010 required for skimmer box lid certification. 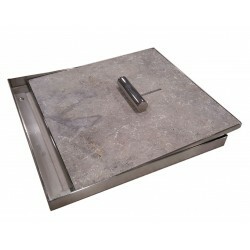 The slot or keyway cut into the paving material also provides adequate ventilation yet is not a trip hazard. Attractive Registered Design protected by Australian Patent. Matches coping with a flush minimalist finish. Safe for children and pool builders. 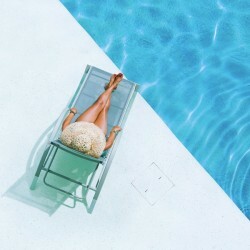 Complies with Australian Standard AS 1926.3 2010 Swimming Pool Safety - Water Recirculation Systems. 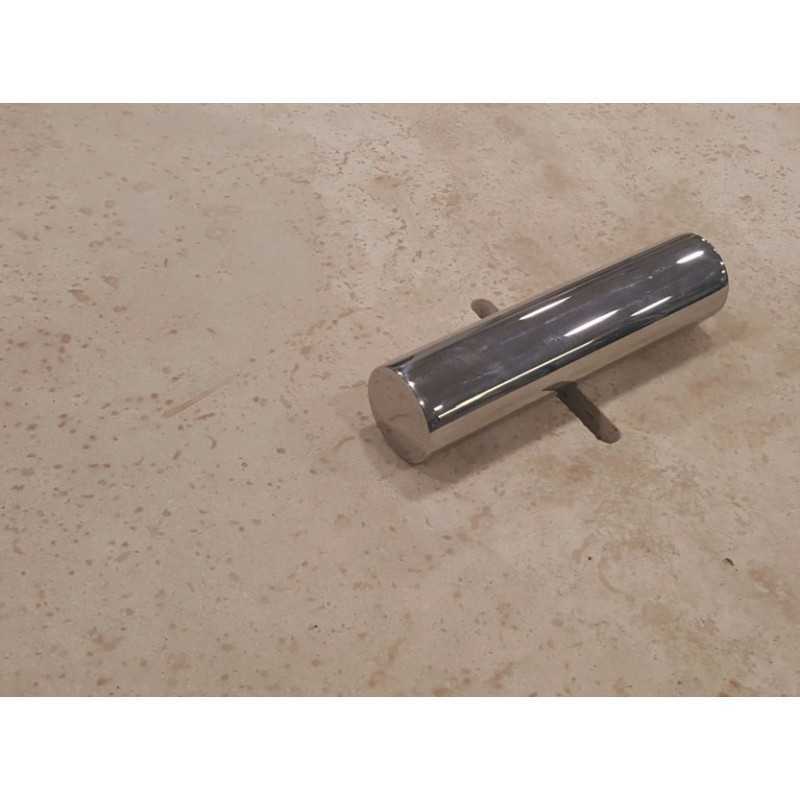 Water Jet manufacturing process guarantees tight tolerances and a great finish. Durable marine grade 316 stainless steel tray means you won’t get call backs for cracked or broken lids. Independent and removable, with no difference in electrical potential.